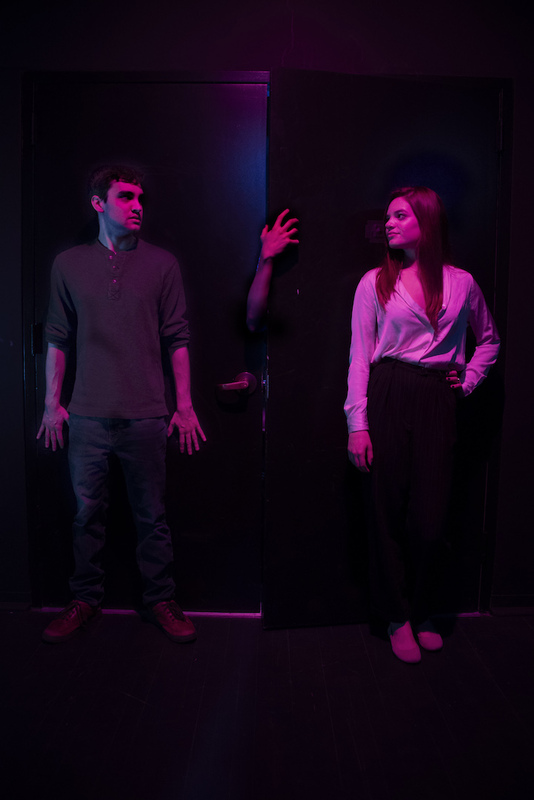 STLN Co-Editor Kallan Dana ’19 speaks with Max Clifford ’21 about his experience stage managing the final studio lab of the semester, Richard Greenberg’s The Author’s Voice, directed by Nick Leonard ’20. KD: Do you feel like you have a system you follow as a stage manager? MC: It definitely changes with each individual director. This is the third studio lab I’ve stage managed, after The Colored Museum and Revolt. She Said. Revolt Again. The Colored Museum was a lot more hands-off, while Revolt involved a lot of props and lighting and setting up the space. I think The Author’s Voice is an in-between. As you start to do more plays you find a routine. Having the experience doing two other studio labs, especially one as complicated as Revolt, has made me know that I am equipped to handle it all. KD: What’s your prep work going into a show? MC: Usually I meet with the director at least once before rehearsals start to figure out what the director wants from me going into the process. Especially with a studio lab, a lot of my work–besides the general requirements of being a stage manager–is based around what the director wants of me. We’ll meet and talk about the director’s vision, what the director wants to do, the set-up of the stage and the audience. Nick pitched to me the idea of a bit that involves water and asked me to see whether or not that would be ok, and he also asked me to lighting design the show. KD: What was your lighting design experience prior to the start of the show? MC: I had none! I’m currently taking the lighting design class, though. KD: What’s that been like? MC: It’s been a lot of fun. The closet in Studio A is part of the scenery. Lighting that was really interesting, because it’s almost like the room glows. Nick has been a really helpful. He’ll say “this is how I’m seeing this,” and I can be like “ok, this is how I will represent that in lighting.” If I were to just cold read the script and light the show, I think it would be a lot different. Being in the rehearsal process for the show has helped a lot in terms of how I was designing the show. It’s been really fun. I want to be a lighting designer, so it’s great that I get to start doing that. KD: What is your lighting concept? MC: The world of the play starts out very standard and conventional, and as it goes on it twists into this very dark and cruel world. For a lot of the play, it bounces back and forth between what I call “sitcom lighting,” which is very standard front-lighting, and more colorful and angular lighting for scenes that become a lot more intense. As the play begins to distort, I let the lighting distort with it. KD: How would you describe the show for people who know nothing about it? MC: It’s about someone who is taking advantage of someone else to achieve success. Specifically it’s about one man and his gnome who is able to write very well. He lets the gnome live in his closet in very terrible conditions, and in exchange the gnome will write a book for him and he will get successful off of that. It’s about that process and the way in which their relationship is very toxic and begins to break down. There’s this external character who comes into this world and Todd and Gene try to wrangle with that and keep the illusion up. It’s about the way those three characters are trying to maintain a sense of normalcy when there’s a lot of dark, twisted things happening in the background. KD: What have rehearsals been like? MC: It’s a lot of fun! This show is very dark and there’s a lot of dark themes…but rehearsals are a lot of fun! The actors are all really great people, they’re all really funny, everyone keeps such a good energy up. Nick keeps us energized, on breaks everyone is having fun and laughing. It’s really fascinating to watch everyone go from telling jokes to snapping back into yelling at each other in the scenes. Everyone has really good chemistry, and each person is a really great team player. It’s one of those situations where everyone coming in is excited, has such a great amount of energy that they’re putting into it. It’s just been a great process to be part of. KD: What do you imagine yourself continuing to do in the theater both at Skidmore and outside of here? MC: Going into Skidmore I didn’t even know what I was gonna do, I was taking chemistry courses before Lary made me take Intro to Theater, and now I’m a theater major. I definitely want to be a designer. But I’ve definitely had a lot of stage management experience here, and that’s affected what direction I want to go. This summer I’m going to do a stage management internship, so I’m starting to already professionally begin stage management, which is really exciting and nerve-racking. I’m really excited for that experience. I’ve had so much fun and a lot of success stage managing stuff, but ultimately I do want to be a lighting designer. Making it far in that would be amazing. The Author’s Voice runs in Studio A March 15-17 at 7 PM each night. Email labtickets@skidmore.edu to reserve your seats!